Here’s how to help preserve Berkeley’s Beaux Arts beauty! Join the group: Our volunteer work parties meet the first Saturday of every month from 9 a.m.-11 a.m. at the northwest corner of Los Angeles and The Circle. Tools are provided, but feel free to bring your own pruners, kneelers, gloves, etc. We pull weeds, pick up litter, trim hedges, sweep gutters, and do whatever else needs doing around The Circle and adjoining Fountain Walk. Each winter, we decorate the bear cubs on the fountain for the holidays and string garlands of lights around the perimeter of the fountain island. Do it yourself: Volunteer when it ‘s best for you. 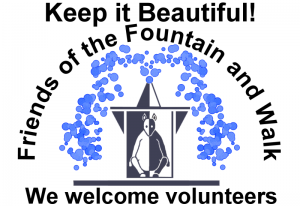 If you can’t always attend our monthly work parties, sign up to “adopt” an area around the fountain and walk to care for on your own schedule. Contact us via the link below to find out more. Holiday party: FOFW volunteers get together once a year for a holiday gathering near the end of December. The board: Our board of directors is an active, giving board. We meet about four times per year, with frequent email interaction. The board oversees all FOFW business, including fund-raising, spending for repairs and maintenance projects, and community outreach. Advisors: FOFW is always on the lookout for people with special skills to help advise the board in areas such as legal issues, public relations, etc. If you have a special skill and would like to get involved, please drop us a note. Click here to contact us for more information on all volunteer opportunities.